The Body Shop is a cosmetics retailer who provide various beauty products. This vintage POS display was used in order to gain the attention of passers-by. For more keep on reading. As you can see from the photo. 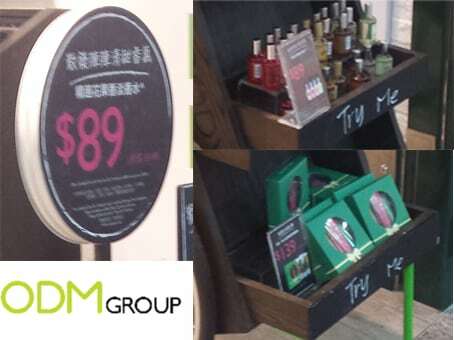 This is a highly unique and vintage POS display which was used in Hong Kong. 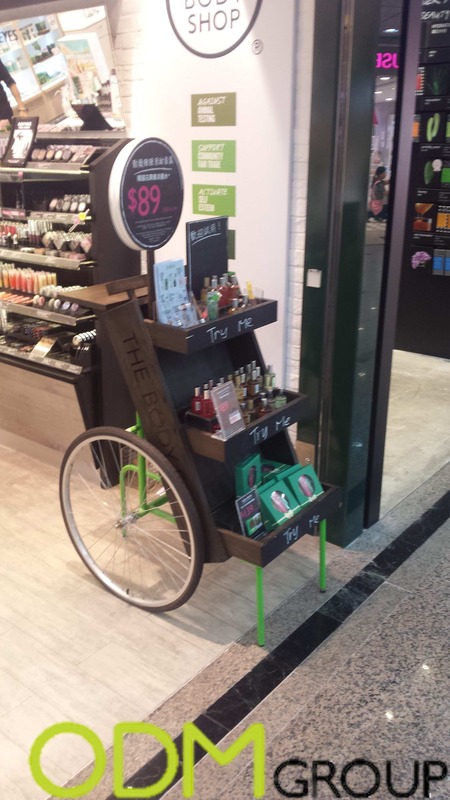 The vintage POS cart is highly different compared to the displays of other cosmetic companies. This is likely to be eye-catching as it differs to competitors and is likely to gain the attention of passers-by for longer. The vintage POS is very reminiscent of an olden day market cart. It has a chalkboard and the chalked in “try me” reinforce the time period aesthetic. The shelving also makes it look like a market stall. What is also extremely interesting is that this vintage POS display also draws attention to the posters behind the cart. The posters add value to The Body Shop products. The posters state that the Body shop is “against animal testing”, “support community fair trade” and “activate self-esteem”. By visually displaying these company goals. The customer is likely to perceive The Body Shop as an ethical company. This is highly relevant as there is a growing trend among customers to demand goods that have been made ethically. A definite Unique Selling Point that enables The Body Shop to differentiate itself from competing cosmetic companies. Ethical stance can also be used to add value and increase the price of their products. From the photo, you can see that there is a promotion on cosmetics and a gift box. Various posters advertise the promotion. The lollipop sign is also a highly unique advertising tool which stands out. The promotion offered by this vintage POS display is highly likely to influence the customer. Customers are more willing to trial a product that is cheaper. This is highly important as many customers have a perceived risk when they use a new product. Getting a discount on said product also reduces this perceived risk. If the cosmetic product performs well for the intended use, the customer as a result will purchase this product in future. The Body Shop not only benefits from increased future revenue but also through word of mouth. The customer if satisfied with the product on promotion. They may raise awareness of this product to friends or family. Which will increase the amount of potential customers.